Finding rock salt may not be easy, as Monday night's winter storm approaches. MILWAUKEE — The next snowstorm of the season has people on a search for salt for their homes. 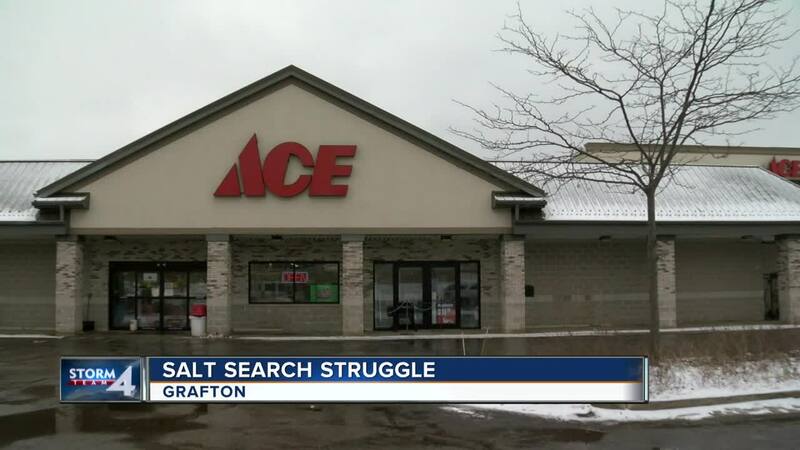 At Ozaukee ACE Hardware, phones were ringing constantly with questions about salt supply. "Not today. We should have more in the morning." "We are out right now." They can't keep salt on the shelves. "It's been crazy," said Paul Kalies, co-owner at Ozaukee ACE Hardware. "We can't keep it in stock. We had seven skids last Wednesday, and they were gone almost immediately. We had seven skids on Saturday, and they were gone almost immediately." Kalies said they had a line to the back of the store Saturday, and they were selling the 40-pound bags of salt before they got off a semi. He says they sold roughly 17,000 pounds of salt. Monday morning, residents were leaving empty-handed. "I've been trying the last couple days," Janet Erspamer of Grafton said. "Used the last of it this morning. That's it." "This was my first try for salt this morning, and it was a fail because they're out," Terry Very of Cedarburg said. "They said they'll have it tomorrow. So we'll be back tomorrow." Even with a full shipment coming in the morning, Kalies says it's been tough to order salt this season. "Just one of those years, I guess. We had a year where roof rakes were gone quickly, too. As soon as the truck came with 50 of them, boom, they're gone." "If by difficult, you mean impossible, I guess," Dave Stencel of Grafton said. "Never in my life." While it has been difficult to get salt, there are still places that have plenty. Village ACE Hardware says all three locations in Milwaukee have salt, calcium chloride and WalkSafe, a pet salt. If you are out of luck in your salt search, a mixture of rubbing alcohol, dish soap and hot water can hold you over. You can use a mixture of half a gallon of hot water, six drops or so of dish soap and a 1/4 cup of rubbing alcohol. The combination helps prevent further icing and speeds up melting. You can also put the mixture in a spray bottle to spray on car windows when they are iced over.